I got into the slots as a kid in late 1966 and stayed with it through 1969 into early 1970, when most of the commercial tracks in this area closed. Although I raced in a few organized races, most of the time I just enjoyed running the cars I built from scratch on rented time. Long Island itself (Nassau and Suffolk Counties) had quite a few tracks in the 60's. If you include Brooklyn, Queens and Westchester, there were even more in a 30 mile radius from my home. Here are some of the ones I raced. Aurora Raceways in Hempstead was a huge operation run by Aurora Inc., whose headquarters was also in Hempstead at the time. It had two floors. The main floor had four Americans; two Kings, a Hillclimber and another smaller American shaped like the King. It also had a couple of HO tracks going. The bottom floor had two tracks larger than the King, which were used only for organized racing. East Meadow Raceways had a couple of homebuilt units, one of which was listed as the largest slot track in the country around 1964 or 5 according to an article in Car Model Magazine (as I remember reading a few years later). Champion Raceways (my favorite) was in Massapequa. It had two huge Englemanns and a smaller counter area but it was set up for high level parts. Pictures of a track of the same model as one of the Champion tracks be seen on the Elmsford Raceway, Elmsford NY website. It is the one they call Nuvolari, after the famous race driver. Elmsford, by the way has been in continuous operation since the 60's with the same owner. It is about 30 miles from me now. 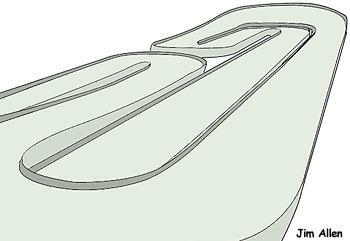 The other track at Champion was shaped like the American King but the straight was longer and the bank was steeper and higher. Hobbytrack was in Levittown with two good tracks and a very good selection of parts. Vic's in Cambria Heights was the track where I ran in organized races since they had more races for the younger to mid teenage set. It had a King and a Hillclimb track going at all times. Glen Oaks Raceways was in Glen Oaks, Queens on Union Blvd. It was a favorite of the pros in the area, like Charlie Harris of Car Model fame, Gunther Faas, of Faas Fast Wheels (he is still racing!!) Jim Greenaway and others. Glen Oaks ran many pro races, drawing the likes of Jerry Brady, Ursaner, Cozine. It was extremely clean, plush and well run. The tracks were in absolutely great shape. Glen Cove NY was home to Glen Cove Raceways. The night manager there worked with my father during the day and helped me get into the hobby. Farmingdale had a track going called Conklin Raceways. It was the last to close in the mid 70s. Buzz A Rama was in Brooklyn and Phase III Raceways was going in The Bronx. Phase III was home to Phase III parts. Ursaner and Sandy Gross were the Cobra parts drivers, which was also in The Bronx. I was reminded by another Long Island native, Zoney, that there was a slot racing center in Mid Island Plaza (now called Broadway Mall) on Route 106 in Hicksville. It had four or five tracks named after famous racing circuits such as Riverside, LeMans, etc. It was a good place to hang out while your parents shopped in the department stores. There were undoubtedly other tracks, but these are the ones I remember best. Long Island is undergoing somewhat of a slot car revival at the present time. Speedzone in Farmingdale, Slots Alot in Franklin Square, Glen Cove Raceway (not the same operation) and Port Jefferson Raceways are all going well. Most of the tracks seem to be recycled 60's units but are in good shape. I got started with kits such as a Comet Cyclone by AMT, some Champion Snuggler kits, a Monogram Lotus 38 and a Cox GT 40. I have some of these parts still. However, I soon graduated to building. Since I was fairly young (and therefore poor), I did most of the work myself. I remember rewinding Mabuchis using a Model Car and Track article as a guide. I got into chassis building in a big way, building inline and then anglewinders, which for some reason I found easier to build, strange as that may sound. I did save up and got some good motors such as the Champion 517's and later an Orange Picker motor with 25 gauge wire. I built my own chassis jigs and even fashioned a tire truing lathe from an old ac motor and wood! Although some of the chassis looked crude, they ran pretty well. By the time the tracks closed, I was getting into the real cars anyway. I hot rodded Mustangs, Falcons, Novas and others. I got into SCCA racing with the president of my company and we campaigned different GT1 cars for about 10 years in the Northeast region. I still work on and restore Mustangs I own in the summertime for fun. Now that slotting seems coming back, maybe I will have a Winter hobby as well.